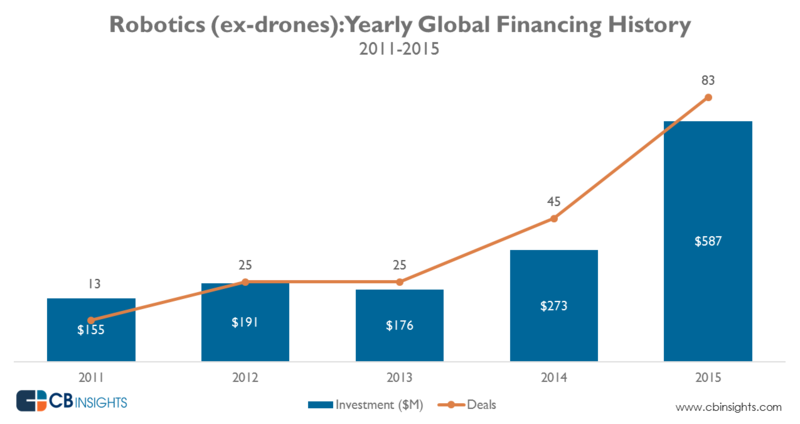 Funding for robotics startup companies rose dramatically in 2015 reaching record highs in deals and dollars. CB Insights, a VC database provider, reported similar findings as seen in their quarterly financing chart. Listed below are the results for March including two billion dollar acquisitions. 6 River Systems raised $6 million in seed funding from VC firms Eclipse and iRobot Ventures. Founded in 2015 by former Kiva Systems and Mimio executives and based in Boston, 6 River is developing next-gen mobile robot fulfilment solutions for distribution centers. SkySquirrel Technologies got $1 million in seed funding. The Halifax Nova Scotia startup is focusing on agricultural crop analytics. nuTonomy, a spin out from MIT with offices in Singapore and Cambridge, received $3.6 million in seed funding in January for the development of autonomous vehicle technology to be initially tested in urban driving situations such as encountered by taxis. Restoration Robotics, the robotic hair transplant company, got $4.82 million equity funding in January says Octa Finance, a Belize-based news company after researching Restoration’s SEC filed Form D. CB Insights reported $7 million. So maybe there were other investors that will show up on later Form Ds. Airware, the San Francisco UAS autopilot maker, got $30 million in a round that included former Cisco CEO John Chambers as an investor. Chambers will join the Airware board of directors. Aarav Unmanned Systems, a spinoff from the Indian Institute of Technology Kanpur, received an unknown amount to enable the company to focus on GIS survey, precision agricultural and industrial inspections using UAS. Aurora Flight Sciences, a Virginia-based developer of UAS tech for defense as well as commercial customers, has raised an undisclosed amount from Enlightenment Capital, a Chevy Chase, MD investor in aerospace companies. Earlier this month Aurora was awarded an $89 million contract for a vertical takeoff and landing X-plane for the DoD. ThermoFisher Scientific is acquiring Affymetrix for $1.3 billion. Adding Affymetrix’s products will help ThermoFisher expand its array of lab equipment and robots into biosciences and genetic analysis workflows. Pasco Scientific, a provider of educational robots, acquired Ergopedia, the maker of the ErgoBot educational bot, for an undisclosed amount. PCS Edventures, a provider of STEM, robotic and UAS educational tools and programs, acquired the assets, IP and inventory of Thrust UAV, an Idaho startup, for $109,000. Shortly thereafter Thrust, a service provider with a racing drone, announced an $825,000 contract to provide their drones to a reseller.